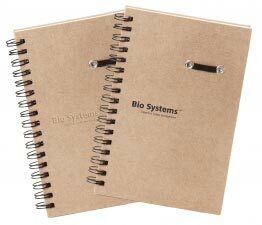 ECO Hard Cover Spiral Notebook - 4" x 6"
Hard cover cardboard notebook with double spiral binding, black elastic pen loop on cover and 50 white lined sheets (non-refillable). Silk screened - flat Centered 1 1/4" x 1 1/2"
Debossed Centered 1 1/4" x 1 1/2"
Product Size : 1 1/4" x 1 1/2"
Imprint Size : 4” x 6"
Includes one colour imprint. Setup $60. IMPRINT CHARGES: Price includes 1 location / 1 colour imprint. Additional location/color $50 set-up and $0.60 running charge each per location.